Founded in 1845 as the Glasgow Government School of Design, it changed its name to The Glasgow School of Art in 1853. Initially located at 12 Ingram Street, in Merchant City, it was relocated to the McLellan Galleries in 1869. By 1897, work commenced on a a new building to house the School on Renfrew Street. This new building was designed by Charles Rennie Mackintosh. Since that time the School's campus has grown. In 2009, an international architectural competition was held to find an architectural design team who would design the Phase 1 building. The competition, was won by Steven Holl Architects, based in New York in conjunction with Glasgow based JM Architects. The new building named The Reid Building, completed in 2014, sits opposite the Mackintosh Building. The School has produced most of Scotland's top contemporary artists and many Turner Prize nominees, with recent Turner Prize winners including Martin Boyce in 2011 and Duncan Campbell in 2014. The School of Architecture is held in high esteem by the architecture profession, with the School of Design being described by Design Week as "leaders in design education". 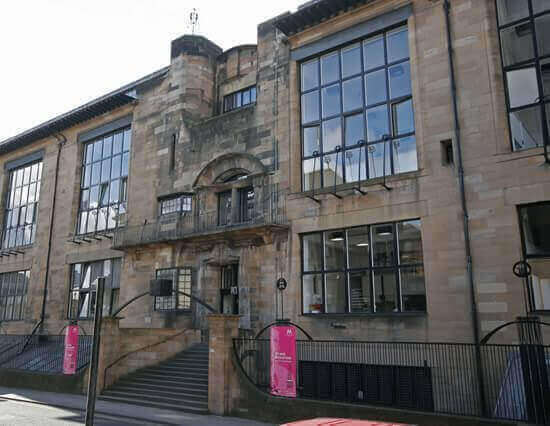 Glasgow School of Art is organised into three academic schools, the Mackintosh School of Architecture - named after Charles Rennie Mackintosh it's most famous student, the School of Design and the School of Fine Art.